The Boston Red Sox won 62 more games than they lost en route to a World Series championship in 2018. Once you've climbed that high, it's not easy to go higher. And yet, a trade for Paul Goldschmidt would help them do exactly that. Right off the bat, understand that this is strictly speculative. Such a trade is neither imminent nor especially likely. It's been reported that the Arizona Diamondbacks are willing to listen to offers for Goldschmidt, who leads all first basemen in wins above replacement since 2013, according to Baseball Reference. However, one executive told Fancred's Jon Heyman that there's a "remote" possibility of him actually being dealt. For their part, the Red Sox have more pressing needs. The pitching roles vacated by Nathan Eovaldi, Craig Kimbrel and Joe Kelly must be filled. It's also in their interest to upgrade a catcher spot that produced minus-1.4 wins above replacement in 2018. However, the situation at first base shouldn't be overlooked. Though Steve Pearce (MVP) and Mitch Moreland (huge home run in Game 4) were heroes in the World Series, they and other Red Sox first basemen produced only 1.6 WAR during the regular season. Most of that came from Pearce, who's now a free agent. The simple solution is to re-sign Pearce and keep platooning him and Moreland. This is also the cheap solution. Given that, according to Alex Speier of the Boston Globe, the Red Sox are poised to be hit hard by the luxury tax in 2019, they may prefer such solutions. Still, president of baseball operations Dave Dombrowski isn't one to shy away from a blockbuster trade. In the case of Goldschmidt, he has a chance to snag a superstar that's reportedly being neglected by the New York Yankees. Paul Goldschmidt is drawing significant interest (understandably) but not from Yankees. Maybe they really will give Luke Voit a shot. This could be a smokescreen. Or, the Yankees could be preoccupied with other pursuits. Those definitely include starting pitchers, and they may or may not include Manny Machado. What's all but certain either way is that the 2019 Yankees will be better than the 2018 version that got overwhelmed by the Red Sox in the American League Division Series. The same will probably true of the Houston Astros, who got overwhelmed by Boston in the ALCS. It therefore behooves the Red Sox to go forward in their own right. Which brings us to what Goldschmidt could do for them. The 31-year-old may not be one of Major League Baseball's most popular players, but he's unquestionably one of its best. An average season for him since 2013 consists of a .947 OPS, 30 home runs, 17 stolen bases and 6.0 WAR. Take all that and put it in a Red Sox lineup that's already anchored by AL MVP favorite Mookie Betts, J.D. Martinez, Xander Bogaerts and Andrew Benintendi, and an elite offense looks even better. If there's a reason to force concern about Goldschmidt, it has to do with how he didn't look superhuman in 2018. His strikeout rate ticked up, and his .290 batting average and .389 on-base percentage were his worst since his pre-superstar days of 2011 and 2012. Not so coincidentally, there was a major difference at Chase Field in 2018: a humidor. It had an immediate power-suppressing effect, according to MLB.com's Mike Petriello. Per ESPN's park factors, it ultimately helped transform Chase Field from an extremely power-friendly park to a not-so-power-friendly park. The only downside of trading for Goldschmidt is that the Red Sox would be guaranteed to have him for just one year. And said year won't come cheap. In addition to paying his $14.5 million salary, the Red Sox would have to give the D-backs talent for him. These aren't simple matters for a team with a bloated payroll and a barren farm system. But more so than any other team, the Red Sox should be looking to go all-in on 2019. 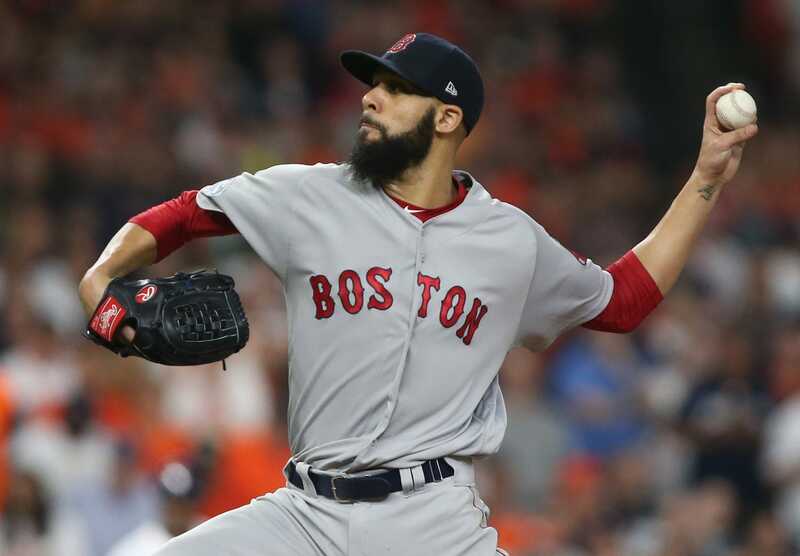 Next year could be their last with Bogaerts, Chris Sale, Rick Porcello and Martinez, who can opt out of the final three years of his five-year, $110 million contract. In the meantime, there's not a whole lot they can do to improve their luxury tax status or farm system anyway. They might as well double down before they're obligated to pivot in a new direction. Making a deal will be the hard part, but it shouldn't be impossible. The Red Sox could offer the Diamondbacks Moreland as an immediate replacement and a future piece of trade bait. They could also offer top prospect Michael Chavis (No. 69 at MLB.com) and an MLB-ready pitcher, such as Mike Shawaryn. The prize would be one of Major League Baseball's best players. The ultimate reward could be another magical season.